Residents of Maryland counsel visitors to "Treasure the Chesapeake". ​The license plates of New Hampshire declare "Live Free or Die". Maine, on the other hand, takes a far more relaxed attitude. Its license plates simply say "Vacationland". This simple message certainly rings true to the legion of Americans and canadians who have experienced the pleasures of our northeasternmost state. From the off price mecca of Kittery in the south to Mt. Katahdin, the state's tallest summit [5367 feet] in faraway Baxter State Park, Maine has built an international reputation as a prime destination for a genuine, old fashioned American vacation. Maine weather can be somewhat crusty. Summer often doesn't begin until late June, and even then early mornings can be chilly. The coast is legendary for fog and mist, as many a sailor will attest, and black flies, followed by mosquitoes are constant wilderness companions. Yet I once escaped miserable weather in Vermont and New Hampshire by trekking east to Acadia National Park -- on the small, hilly island of Mt. Desert. Acadia, a bequest if the Rockefeller family, is one of the most visited parks in the national park system. But its combination of easy oceanside biking and hiking -- not to mention the views from the top of Cadillac Mountain[which you can reach by Cadillac, or any other automobile!] can be experienced with little interference from other visitors. Our most recent trip however, took us[me, my wife, and two daughters ages 5 and 8 to destinations which harken back to a more gentile form of family travel. Our first stop was the Samoset Resort in Rockport, a coastal town along Penobscot Bay. The Samoset has been a favorite of New Englanders for more than a century. Once one of the premiere grand hotels, mention of its name will bring a wistful smile to a generation of travelers and honeymooners. There is nothing left of the old hotel but the million dollar view. A new complex has been built on the fire-ravaged ruins of the old structure, with all the amenities families or couples might desire. The ocean-view golf course is a nationally renowned , but my favorite activity was rising at sunrise for a walk over the gold course and along the mile-long breakwater out to the Breakwater Light, now on the register of historic places. Horses and automobiles once travelled the granite extension. Today however, only fishermen and pedestrians are to be found. We could have easily limited our visit to the resort -- there is a full range of activities --a pool, horse shoes, tennis and bike riding for the kids, and exercise programs for adults. But the fun of being in Maine is being able to go almost anywhere and discover something worthwhile to do. One afternoon we drove to nearby town of Camden, where there are a number of boat rental and friendship sloop offerings. Be advised that some of these companies do not accept children as passengers. We skipped the boat rides for a walk in town and ice cream. We also checked out the swingset displays at Cedarworks, a high end manufacturer of backyard equipment. We visited the town of Thomaston, just south of Rockport on July 4. We set up on someone's front lawn to watch the parade, whose main attraction proved to be the candy that marchers threw at the kids lining the parade route. "Destinations which harken back to a more gentile form of family travel"
Thomaston is the site of a correctional facility -- a state prison -- which sits on Main street in sight of the grand homes of the city elite. The building is a reminder that prisons, and prisoners, used to be considered just another part of the community. In Maine, it seems, they still are ... and lucky for us! We spent a fine time in the prison store, where hand made products were on sale. Every item, from the bat houses to bread boxes to the wagon we purchased for our soon-to-be born son sported the serial number of its creator along with the [very reasonable] price. Kids sometimes have a hard time seeing the sport in antique and junk shops. This can be a problem in Maine, which boasts countless such attractions. Our kids were kept happy and involved searching for reasonably priced stuff that they wanted. It proved to be a mutually satisfactory arrangement. We continued south along route 1, winding our way down the coast past Freeport, home to LLBean and countless off price marketers. 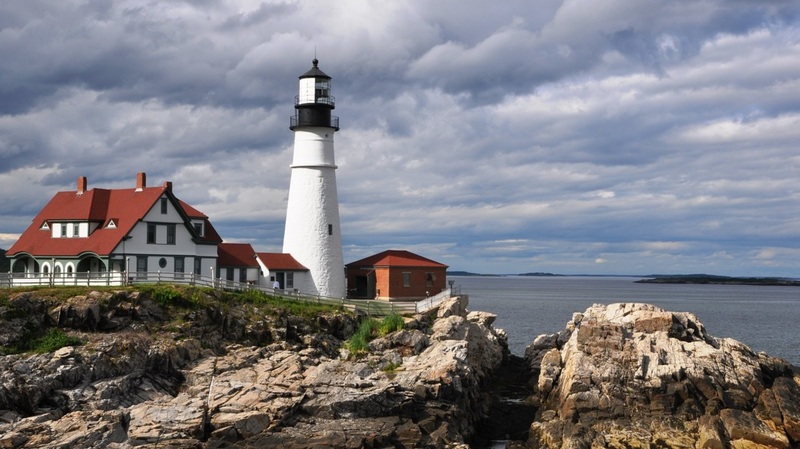 Our destination was Cape Elizabeth, just south of Portland, and the Inn by the Sea. Friends had recommended this spot as a perfect getaway... and they were right. Even with our kids, we were able to enjoy that sense of relaxation and elegance that made the Inn by the Sea worthy of a return visit[probably without the kids!]. The Inn is a short walk through a beautiful marsh to a wide beach. I was able to swim for one mile along shore without being disturbed by anyone, while the kids busied themselves with a land reclamation project of major proportions. The pool was warmer than the ocean, and the hot tub even warmer. The Inn does not fashion itself as a family destination, but that didn't prevent our well-travelled kids from putting it near the top of their list for places to stay. Perhaps York Beach had something to do with their enthusiasm. York is a seaside town with an old-fashioned boardwalk about an hour south of Portland. There you can see salt water taffy being made in a storefront window ...and visit the amusement park. This small park has changed little since my youth, when it did not have to compete with the mega-attractions so popular today. The rides still supply plenty of thrills ... even a little nausea for those almost forty. As this year's summer vacation approaches, my children are insisting that we return to York Beach. I may acquiesce, as long as I don't have to go on the rides. The Samoset Resort offers a range of rates, including a family package with breakfast and one day of kids' camp. Rates for parents and one child from $121-$270. ​Tel 1800-552-1070Inn by the Sea 1800-888-1287. Room rates from $75 to $390.